Fourth Row Center: Film Writings by Jason Bailey: On DVD: "Trust"
What happens after that will not come as much of a surprise—and the film isn’t structured as if it will be. Less than 1/3 of the way into the story, after that initial meeting, Charlie takes Annie back to his motel room, has her model the lingerie he has bought her, and then rapes her. The turn of events is not packaged as a shock—the tension, awkwardness, and subtle pressure of the sequence is unbearable, and Schwimmer lets the dialogue (and pauses) carry the scenes without obvious overwrought scoring or scare edits. What is surprising and unusual about Trust is how it confounds our expectations for what will come after that. 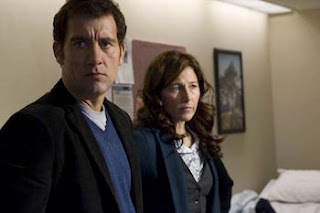 Because Will is played by Clive Owen, the modern master of the reluctant-man-of-action thing, we assume that he will find himself dissatisfied with the incompetence of the authorities and go after the man who violated his little girl, vigilante-style. Because Annie has been so exploited and debased, we assume that she will run to his arms and beg her daddy to make it right. But Will is not a simple hero, and Annie is not a simple victim, so what happens instead is more believable, more interesting, and ultimately more tragic. Because of the very innocence that Will fears she has lost, Annie cannot fathom the monster that her Charlie has shown himself to be; she’s able to apply the kind of twisted teenage logic that can lead to her saying something like “I just hope he’s okay.” Will becomes so obsessed by what was done to her that he blows their relationship altogether—she shuts herself down, becomes obstinate and angry, turns this technologically-inspired rift into the age-old dilemma of the overprotective parent and the rebellious child. Meanwhile, the well-shaded differences between Will and Lynn’s very different brands of utterly desperate helplessness begin to tear at the fabric of their marriage. It’s a relationship that is, in the early scenes, comfortable and believable; as they fall apart later, both actors do some of their best work to date. Keener has a scene in their dining room where she finally lets him have it, and she doesn’t hold back—it’s the kind of raw, unguarded acting that doesn’t make its way to the screen as often as you’d think. Owen, who plays most of the film in a muted key, has two scenes of similar power. In one, he confesses his simmering rage to Annie’s counselor (the always excellent Viola Davis), and though Schwimmer’s camera almost uncomfortably close to him, he doesn’t flinch. In the film’s final scene, he displays such open and heart-wrenching emotion that we’re taken aback. But the most remarkable work is done by the newcomer Liberato, who is given a (to say the least) difficult and demanding role and doesn’t miss a beat. She plays scenes that are, for lack of a better phrase, “acting showcases” (a furious blowup in her bedroom, a tearful resignation on their stairs), but the moment that lingers longest is one with no words at all: the way the light just goes out of her eyes at that darkest and most tragic moment. Trust is a tough, uncompromising movie—it is hard to watch, and offers no easy answers or pat resolutions. The subject matter could have (and has been) done at TV-movie level, and there are moments where it veers dangerously close to that. But the sensitivity and intelligence of the telling and (especially) the playing pulls it back. This is a fine, harrowing piece of work. "Trust" is available now on DVD and Blu-ray. For full A/V and bonus feature details, read this review on DVD Talk.